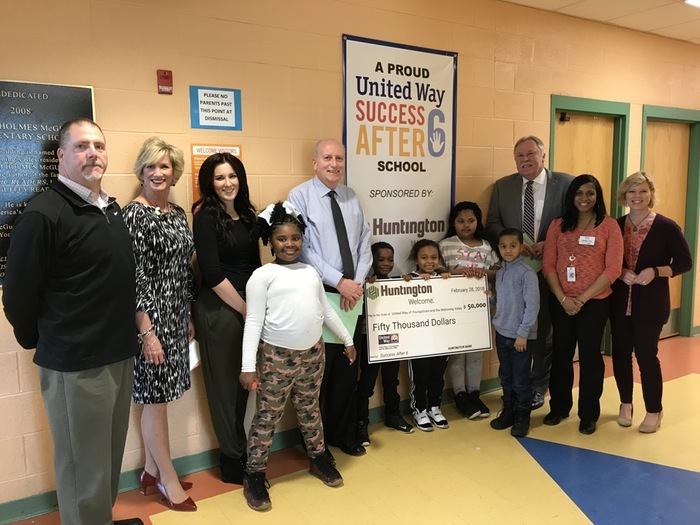 United Way recently received a $50,000 contribution from Huntington Bank to support the Success After 6 initiative at McGuffey Elementary School in Youngstown. William Shivers, president of Huntington Bank’s Mahoning Valley and Canton regions, and Sandy Upperman, regional marketing manager, presented the check. Success After 6 is in eight schools in Youngstown, Girard and Liberty. The early-childhood education initiative is focused on kindergarten to sixth-grade students. It provides tutoring, vision screenings, food pantries and family events. Additionally, it provides after-school programming with academic support and enrichment opportunities to 100 children in each school. Above, Shivers, third from right, presents the check to McGuffey faculty and students. August 19, 2017 12:04 a.m.